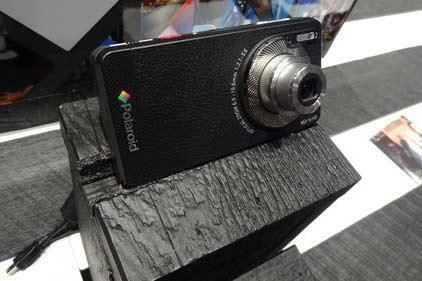 Polaroid finds the whole concept of a "camera-phone" a bit insulting. So it is launching a phone-camera, an Android-driven Smart Camera that is mainly for taking pictures, but can also make the occasional phone call. The SC1630 Smart Camera looks like a miniature Polaroid camera from the front, with the traditional black exterior and a 3x optical lens that extends out beneath a standard camera flash to take 16-megapixel photos. On its flip side is the ubiquitous Android home screen, with lines of apps and home buttons across the bottom. "We start off with a camera frame and then we're trying to make this device smarter," said executive vice president Emanuel Vorona. The device is due to launch around April in the U.S. for a price of US$299, but Vorona said Polaroid is still finalizing technical and financial details. Demo models at the Consumer Electronics Show in Las Vegas worked but showed an operating system version of "X.X," which the company hopes to bring up to the latest Android 4.0 when sales begin. Polaroid has negotiated to have the Android Market app pre-installed on the device, and hopes the developer community will come up with customized apps that embrace it as a camera first. As with many Android devices, users can easily share the pictures they take online. It also has Bluetooth connectivity for connecting to external devices, including Polaroid's own line of instant mobile printers. The company is still in negotiations with carriers, but may also sell a version without a contract, which will have an empty, usable SIM (subscriber identity module) slot as well as Wi-Fi for Internet connectivity. Vorona said the company hopes to develop the product to a point where users will consider it as their main choice for both photos and phone calls.